Earlier this month, Instagram announced that they plan to introduce ads to the app within the coming weeks. Yesterday, the company published a blog entry that provides more detail about the ads and announces that ads will start appearing in US users’ photo streams starting next week. A mock-up of what a Levi’s ad would look like on Instagram (from Instagram’s About Ads page). 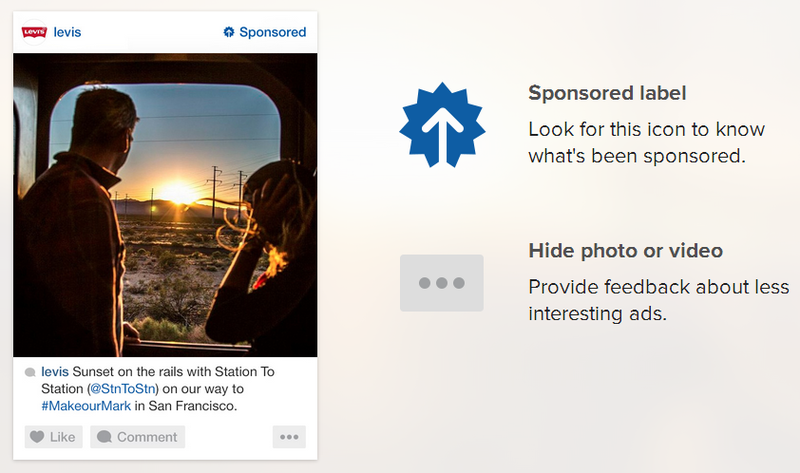 Each ad will have a “Sponsored” label, which users can tap to learn more about how Instagram advertising works. Users can also hide and provide feedback about ads they don’t want to see with a single button tap. The company says this feedback will help them improve their ads over time. The advertising system will use information from both Instagram and Facebook to display relevant ads. This may include the videos and photos users liked and the interests they listed on Facebook. The company mentions that all Instagram users will still see ads from time to time, whether or not they use Facebook. Only a few brands that are already active on Instagram will be participating in the initial advertising campaigns. According to the company’s blog post, they “want ads to be creative and engaging,” which is why they’re starting with brands “that are already great members of the Instagram community.” Some of these brands include Adidas, Paypal, General Electric, Michael Kors, Levi’s, Burberry, and Starwood Hotel. Greg Sterling of Search Engine Land also mentions that the initial “ads” will be more of “spots” that introduce and demonstrate the new advertising system. He points out that this is “another interesting and perhaps unique approach” that Instagram is taking to fully prepare users for the advertising system’s full implementation. It’s also interesting to note that these examples seem to be more about promoting the brand in general instead of encouraging viewers to buy, register, or visit a website. There hasn’t been a lot of user discussion on this news just yet, but we can expect users to voice out their opinions once the ads go live. There’s no news of an international implementation just yet, but we’ll keep you posted. Talk to us if you want to work with a digital media agency that can develop an effective social media strategy for your brand.